Thanks to relentlessness of the health-care sector, prospective students who are interested in pursuing a medical career have a significantly positive outlook in regards to getting a return on his or her investment. Aside from choosing a medical career that best suits your attributes, it’s important to consider which ones have the highest growth per year. More specifically, the health-care jobs with the highest projected growth fall into the category of ‘Allied Health,’ which refers to “a cluster of health professions and covers as many as 100 different jobs (but not physicians and nurses).” According to HealthDegrees.com, there are ten health-care careers that can expect to grow 25% annually, pointing to long-term job stability. Job Overview: This job is one of the fastest growing health careers because they’re needed in every medical office. 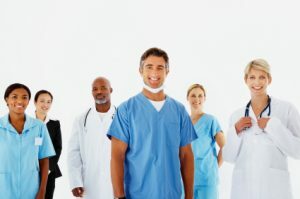 While their responsibilities can vary from office to office, medical assistants are generally tasked with handling administrative and clinical duties such as: answering telephones, greeting patients, updating and filing patients’ medical records, filling out insurance forms, handling correspondence, scheduling appointments, making arrangements for hospital admission and laboratory services, and managing billing and bookkeeping. According to projections, medical assistants will be the fastest growing health-care job through 2014. Education: Medical Assistants can complete a postsecondary program that lasts either one or two years. The one year program results in a certificate or diploma, while the two year program results in an associate’s degree. FNU offers an Associates of Science in Medical Assistant Technology. Job Overview: Medical and Health Service Managers are needed to successfully operate a health-care business. Like any manager of a business, these administrators are responsible for planning, directing, coordinating, and supervising the delivery of services. Depending on the type of business, specialists tend to take charge of a specific clinical department or service, while a generalist will manage or assist in operating an entire facility or system. Nonetheless, both specialists and generalists are expected to optimize the efficiency of delivery. Education: Medical and Health Services Managers are required to possess a master’s degree in health services administration or business administration. There are exceptions for smaller organizations or facilities who will sometimes hire administrators with a bachelor’s degree. FNU offers an Associate of Arts in Health Services Administration and an MBA, with a focus in Health Services Administration. Median Salary: $67,430 with the potential to reach $117,990 — depending on the organization or service. Job Overview: The increasing demand for diagnostic imaging and therapeutic technology, coupled with an increasing preference for safer treatment methods, sonographers can expect to secure a stable career. Sonographers operate special equipment to direct high frequency sound waves into regions of the patient’s body. In turn, the sound waves are collected to form a videotaped, transmitted, or photographed image, which is needed for a physician’s interpretation and diagnosis. Education: Formal training for Diagnostic Medical Sonographers are offered in two and four year programs, resulting in an associate’s or bachelor’s degree. However, many students opt for the two-year program. FNU offers an Associates of Science in Diagnostic Medical Sonographer Technology. Job Overview: Respiratory Therapists can expect to see an increased demand for their expertise due to a projected increase of cardiopulmonary disease, in conjunction with a surmounting responsibility for early detection of pulmonary disorders, case management, disease prevention, and emergency care. Therapists with experience in cardiopulmonary care skills or working with infants are also in demand. In sum, respiratory care practitioners evaluate, treat, and care for patients with breathing or other cardiopulmonary disorders. Respiratory Therapists are responsible for administering specific therapeutic treatments and diagnostic procedures, under the watch of respiratory therapy technicians. Whereas, Respiratory Therapy Technicians adhere to specific care procedures as advised by respiratory therapists and physicians. Education: An associate’s degree is the minimum for gaining entrance into this field. Bachelor’s degrees are available for those wishing to become advanced respiratory therapists. FNU offers an Associates of Science in Respiratory Therapy. Job Overview: Due to the aging population, there will be a higher demand to treat heart problems and employ diagnostic imaging. Vascular technologists and echocardiographers will also benefit due to technological advances in vascular technology and sonography. Cardiovascular technologists and technicians are tasked with assisting physicians in diagnosing and treating cardiac (heart) and peripheral vascular (blood vessel) conditions, with the option to specialize in invasive cardiology, echocardiography, and vascular technology. Cardiovascular technologists focus on handling invasive procedures in which they prepare patients for cardiac catheterization and balloon angioplasty. During such procedures, the technologist will monitor patients’ blood pressure and heart rate with EKG equipment in order to inform the physician of any causes for concern. In addition, technologists assist physicians by preparing and monitoring patients during open-heart surgery, along with the insertion of pacemakers and stents that function to mitigate blockages in the arteries and major blood vessels. Education: Most Cardiovascular Technologists receive certification through a two-year junior or community college program. However, there is an increasing amount of 4-year programs that will enhance the outcomes of this career. Job Overview: Under the supervision of a physician or surgeon, physician assistants are tasked with providing diagnostic, therapeutic, and preventive health-care services. Their responsibilities include obtaining medical histories, examining and treating patients on behalf of the physician or surgeon, ordering and interpreting laboratory tests and X-rays, and making diagnoses. It’s common to see Physician Assistants as the primary care provider in rural or inner city clinics, where physicians are only available one to two days a week. Education: Physician Assistants are required to complete an accredited education program and pass a National exam for licensure. Programs are typically 2-year, full-time programs. Median salary: $74,264 for full-time clinical practice. Job Overview: Aside from catering to a supposedly niche market, the services of an Athletic Trainer can be used by people of all ages. Primarily tasked with preventing and treating injuries, Athletic Trainers are required to recognize, evaluate, and assess injuries with the goal of providing immediate care in ambulatory health-care centers and hospitals. They also play a huge role in rehabilitating and reconditioning injuries to prevent future complications. Education: Athletic Trainers must receive a bachelor’s degree from an accredited college or university. Job Overview: One of the quickest ways to get obtain a career in health-care, Surgical Technologists provide assistance to surgeons, registered nurses, or other surgical staff during operations. Before the operation, their responsibilities include prepping the operating room by arranging surgical instruments and equipments, sterile drapes, and sterile solutions. Afterwards, they gather both sterile and non-sterile equipment, prepare patients for surgery, and transport patients to the operating room. During the procedure, Surgical Technologists must watch patients’ vital signals, check charts, and help the surgical team dress appropriately for surgery. Education: Community and junior colleges, vocational schools, universities, hospitals, and the military all offer formal training programs for this profession. Job Overview: Clinical Laboratory Technologists assist in detecting, diagnosing, and treating disease. Their responsibilities include examining and analyzing body fluids, and cells. Specimens or samples are analyzed to find bacteria, parasites, and other microorganisms; determine the chemical content of fluids; match blood for transfusions; and check drug levels in the blood to determine the success or failure of treatment. Technologists also get specimens ready for examination, count cells, and search for abnormal cells in the blood and body fluids. Education: Clinical Laboratory Technicians usually obtain an associate degree from a community or junior college or a certificate from a hospital or vocational and technical school. However, many entry-level positions are starting to require a bachelor’s degree with a focus in medical technology or one of the life sciences. Job Overview: As a mechanism of preventive health services, Dietitians and Nutritionists plan food and nutrition programs and oversee the preparation and serving of meals. Their plans are designed to promote healthy eating habits, along with providing dietary modifications, to achieve the prevention and treatment of illnesses. Dietitians typically manage food service systems in hospitals and schools, coupled with education and research, to achieve the aforesaid tactics. Due to public interest and a need for disease prevention, these jobs are currently experiencing high growth in hospitals, residential care facilities, schools, prisons, community health programs, and home health care agencies. Education: Dietitians and Nutritionists are required to have a bachelor’s degree in dietetics, foods and nutrition, or food service systems management.